So I’ve been sampling the new DC #1s, which I find amusing since I really had no interest in trying to check all of these books out. There’s been a lot of coverage at various websites about the books selling out, and how second and in some case third printings are on their way to retailers. Orders for books shipping later in the month are currently being adjusted upwards and the feedback I’m getting from retailers is very positive – however tempered somewhat by speculator frenzy as people are trying to get additional copies to sell to other fans for a profit on eBay. Some stores have therefore been allocating copies, first to their pull file customers and next to their walk-in traffic. I’m curious to see how these books will be sold in the secondary market at the Montreal Comic-Con next weekend. My impressions are mixed. As a veteran fan/reader I was surprised at how much they were depending on the audience to know who these characters are and what their backstory was. There are almost no recaps or explanations. 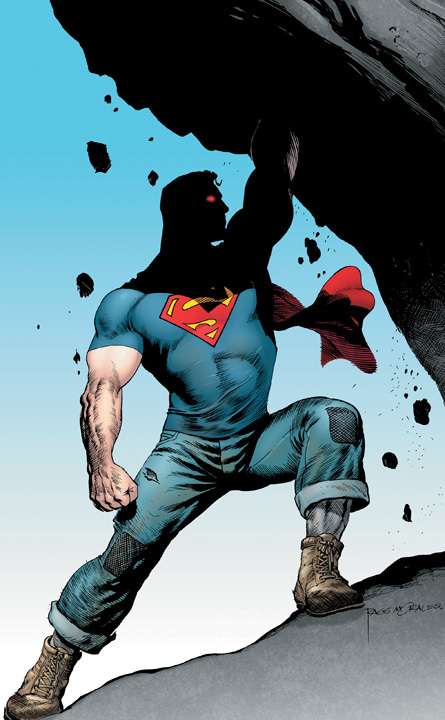 As expected, some characters are rebooted completely (Superman, Green Arrow, OMAC, Stormwatch), while others are virtually untouched and continue where their last appearances were left (Batman, Hawk and Dove, Swamp Thing, Animal Man), and some contain reboot elements AND carry-over from past incarnations (Batgirl, Justice League International). There’s one thing that really struck me about the relaunch/reboot is that nothing seemed particularly fresh. Justice League #1 felt like I was reading an issue of All Star Batman and Robin, which was not a rewarding experience. Green Lantern and Batman team up for the first time to chase down a parademon then decide to confront Superman. Not much happens and the dialogue seems forced. Action Comics #1 should have been the book that launched the DCnU instead of Justice League… it’s well-written and there are elements that I like, like Lex Luthor, but overall I’m a little disappointed because I was expecting a lot from this. The Superman as a threat to the status quo is intriguing, but Clark Kent in this book is basically Peter Parker. Lois is pretty much the same as usual, and I’m not sure I understand why Clark and Jimmy are best friends who just happen to work for rival papers. Interesting enough to seem fresh, so I’ll be back for issue 2. By the way, while I like Morrison’s take on Lex Luthor, it is almost EXACTLY the same portrayal of Lex that Alan Moore used to greater effect in Swamp Thing #53. Detective Comics #1 was awful. Bloody, violent, repulsive… a bad attempt to channel The Dark Knight film and merge it with the Saw franchise. Will I buy #2? No / Will I buy a collected edition? No. Batgirl #1 read like a Batgirl special from before the Killing Joke changed the status quo for this character. TKJ is referenced a lot, but the why of how she “overcame the bullet” is missing and makes the whole venture hollow, like throwaway horse meat to the continuity dogs upset by the elimination of Oracle, who was admittedly a more interesting character than this step backward. Swamp Thing #1… color me intrigued. Yanick outdoes himself on the artwork. I gather this picks up from Search for Swamp Thing mini which featured a different Superman, but he doesn’t seem to realize it. The Superman appearance seems out of place, wearing his weird Kryptonian armor duds and talking about knowing what it was like to die and come back (I gather Doomsday did him in at some point, but the reference seems out of context with the changed reality). Enough Alan Moore Swamp Thing references to make me like it (are those guys supposed to be Invunches?). Swamp Thing and Alec Holland co-existing? Animal Man #1 read well, but I didn’t care for the traced from photos look of Foreman’s artwork and I think the cover was a little off-putting. Seems to be somewhat similar contextually to Swamp Thing with Animal Man’s connection to the red. I’ll give the collected edition a chance when the first story arc is over. Hawk & Dove #1 was really quite awful and I didn’t find it fun in the least. This seems to pick up right from the threads left dangling in Brightest Day. Not interested. Will I buy #2? No. / Will I buy a collected edition? No. Green Arrow #1. I wasn’t expecting much but I was surprised to find George Perez had inked Dan Jurgens giving it a 1990’s look and feel… if you liked Green Arrow on Smallville this is a logical continuation of that version of the character. Young… hip… rich… basically Batman in green tights with an arrow fetish. Gone is the Van Dyke, this has a lot more in common with Mission Impossible, Alias and the Human Target but the character himself is virtually indistinguishable visually from Marvel’s Ultimate Hawkeye. Stormwatch #1 was not particularly interesting – it’s a grafting of a tamer version of the Authority onto the DCU. I found the artwork disappointing, but I do see the connection that is being built to Cornell’s other DC book Demon Knights. OMAC #1 was a pleasant surprise/diversion. Keith Giffen was definitely channeling Kirby through his artwork and while not a challenging read it was fun to look at… but if I want Kirby, why not just revisit the real thing? The good (for retailers and the publisher): I had intended to buy maybe 2-3 of these and ended up buying 11. So if other readers were similarly inclined (as it appears they were) then DC and retailers will have a GREAT September, and September is usually an up month as everyone settles back in at school and work for the fall. I’ll be back for the second issues of Action Comics and Swamp Thing, and possibly OMAC so I would have to say that this is a bit of a disappointment since, OMAC aside, the only books I was interested in going into the relaunch from this batch were Action Comics and Swamp Thing. I will wait for the collected editions of Justice League and Animal Man and perhaps Green Arrow. Keep in mind that I was buying Superman, Justice League and Green Arrow as collected editions before the relaunch as well. This entry was posted in 2011 Releases, Op/Ed by Kevin A. Boyd. Bookmark the permalink.